Two-digit thermometer, based on an ATtiny84 and a DS18B20 1-Wire temperature sensor. It uses a DS18B20 1-Wire temperature sensor, and an ATtiny84 to drive the display and read the sensor. It's just over 25mm square; about the size of a British 50 pence piece. 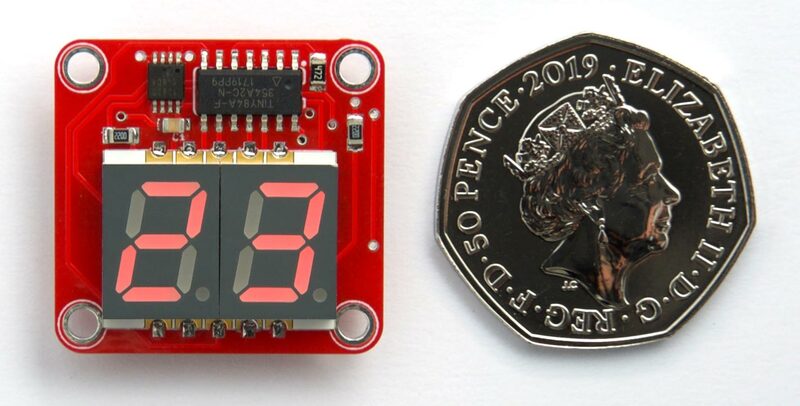 The two-digit thermometer is designed so it could be put in a waterproof case outside the window, to show the outside temperature in all weathers. To conserve power the thermometer flashes the temperature every 24 seconds, and then goes to sleep, and it achieves a battery life of about a year with a CR2032 button cell. The thermometer can display temperatures between -19°C and 99°C. To display temperatures between -10°C and -19°C the left-hand display is used to display "-1". Outside this range it displays 'Lo' for temperatures below -19°C or 'Hi' for temperatures above 99°C. If you live in a part of the world where temperatures regularly reach below -19°C you could change it to light the decimal points to indicate negative temperatures. Circuit of the Two-Digit Thermometer, based on an ATtiny84 and a DS18B20 temperature sensor. The ATtiny84 has just enough I/O lines to drive the display and read the one-wire input from the DS18B20 temperature sensor. I used the 8MHz internal clock, as my 1-wire interface was designed to work at 8MHz. Prototype of the two-digit thermometer, on a mini breadboard. For the prototype I used a TO-92 DS18B20, and a PDIP ATtiny84. The display was a two-digit seven-segment common-anode 3.6" LED display type 3621AS from AliExpress. For the final version I designed a board in Eagle and sent it to PCBWay for fabrication . There's a link to the Eagle files at the end of the article if you want to make yourself a board. This used an ATtiny84 in an SOIC package, and a DS18B20 in an 8-pin µSOP package available from RS-Online  or AliExpress . The resistors, capacitor, and LED are all 0805 size. I soldered all the SMD components apart from the display using a Youyue 858D+ hot air gun set to 250°C. Version of the two-digit thermometer with a yellow LED display. The back of the two-digit thermometer board, showing the CR2032 coin cell. The main program stays in sleep mode most of the time to save power, and gets woken up by an interrupt from the watchdog timer. The DS18B20 returns the temperature as a signed 16-bit integer in units of 1/16th of a degree. This is rounded to the nearest degree and displayed by calling Display(). If the 1-wire interface fails to find a 1-wire device on the bus it displays E0. If the 1-wire interface gets a CRC error in the data read from the temperature sensor it displays E1. It handles the special cases of temperatures below -19°C, temperatures between -19°C and -10°C, and temperatures above 99°C. The main program displays the temperature for a tenth of a second, and then goes to sleep. I found that this was about the shortest display time that was clear to read. (225/6.6) x 240 / 24 = 340 days, or approximately a year. Given that this circuit might be used at very low temperatures I was interested in the temperature range of the components I used. The ATtiny84 and LED display are rated at -40°C to +85°C. The DS18B20 and resistors and capacitors are rated at -55°C to +125°C. The limiting factor will be the CR2032 button cell, which is rated at between -20°C and +70°C. You could extend this by using the equivalent BR2032 lithium-carbon monofluoride button cell which is rated between -30°C to +85°C. Pin Mapping: "Clockwise (like damellis core)"
To program the PCB version I connected to the ATtiny84 using a Pomona test clip that fitted to the top of the chip , using the Sparkfun Tiny AVR Programmer . Choose Burn Bootloader to set the fuses appropriately, then choose Upload to upload the program. Here's the whole Two-Digit Thermometer program: Two-Digit Thermometer Program. 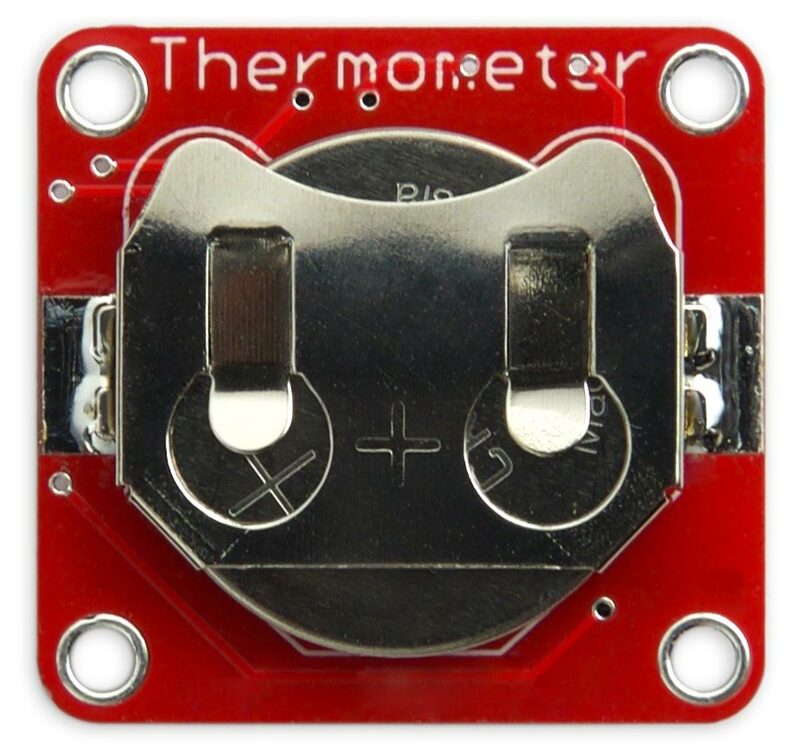 Or get the source from GitHub, together with the Eagle files for the PCB so you can make yourself a board, at: https://github.com/technoblogy/two-digit-thermometer. Or order a board from OSH Park here: Two-Digit Thermometer Board. 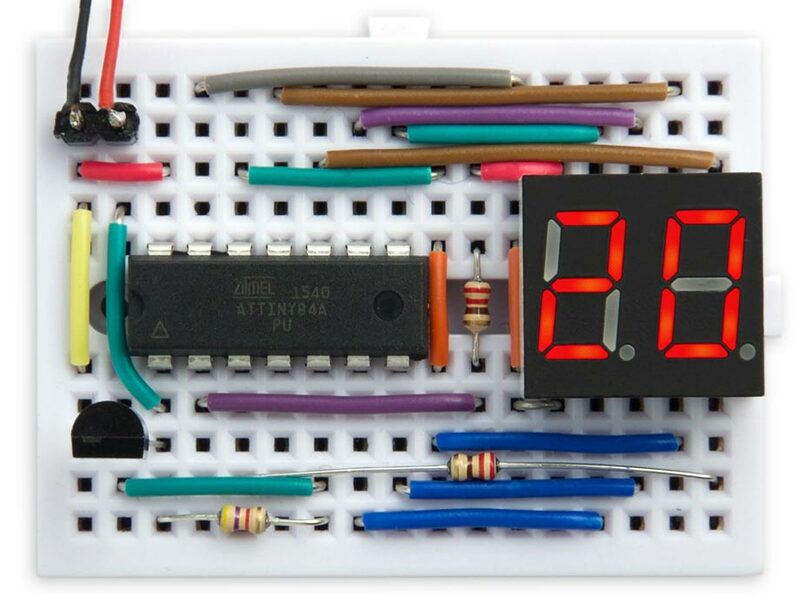 ^ Mini Breadboard from HobbyTronics. ^ PCBWay PCB prototyping service. ^ Maxim DS18B20U+ Temperature Sensor on RS-Online. ^ 5pcs DS18B20 MSOP8 on AliExpress. 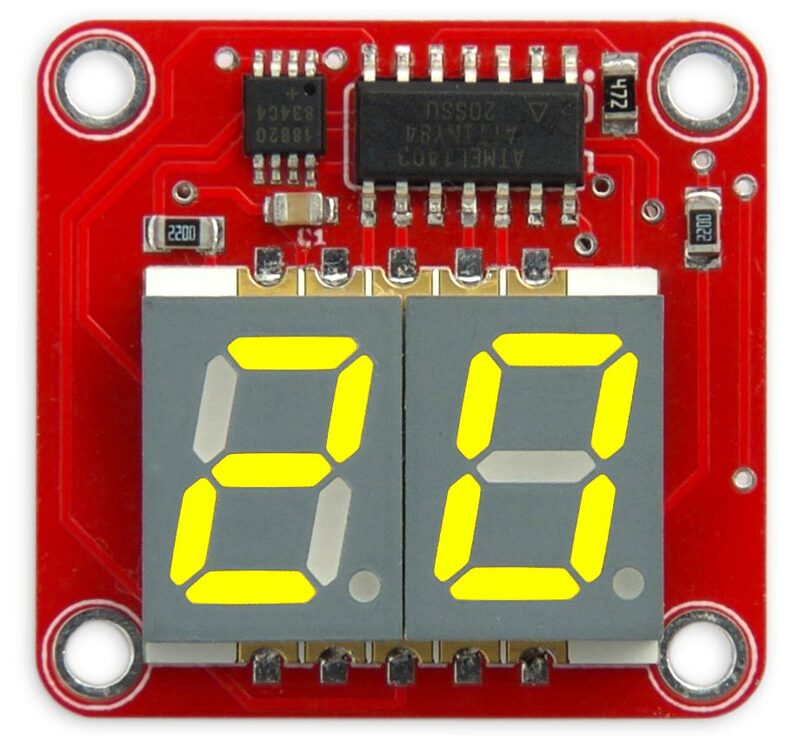 ^ KCDA39-107 Kingbright 2 Digit 7-Segment LED Display on RS-Online. ^ Coin Cell Battery Holder - 20mm (SMD) on SparkFun. ^ Coin Cell Battery Holder - 20mm (SMD) on Proto-PIC. ^ IC Test Clip SOJ SOIC 14 Contacts on Farnell.